Just completed a job? You can prompt the customer to review your business with just a couple of clicks. Go to Quotes and search for the job using the customer’s name, suburb or other unique info in the job description. 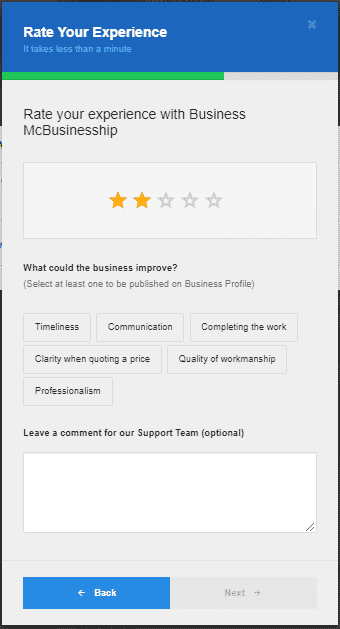 Click Get Feedback and follow the prompts to send the customer an email asking for a review of your work. Is the Get Feedback button disabled? Come back when the quoting period is over, or make sure you’re looking at the customer whose work you did. If the customer marked someone else as the winning business, you won’t be able to request a review without contacting the customer directly. When you send a quote and complete a job for a customer, they have the option to leave you a star rating. 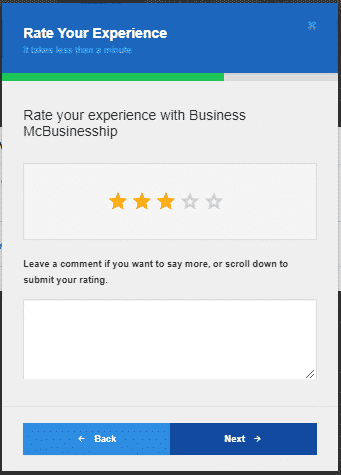 If a customer leaves you 3 to 5 stars they have the option to leave a comment OR they can leave this section blank. If a customer leaves you 2 stars and below they must provide feedback on how your business could improve its services (Timeliness, communication, professionalism etc.). This feedback is published on your business profile. They also have the option to leave comments. 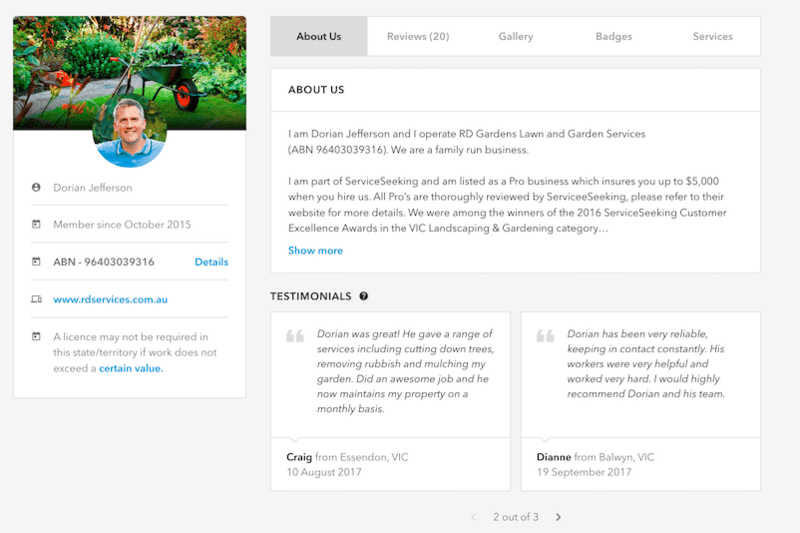 Testimonials are recommendations made by people who aren’t members of ServiceSeeking.com.au. Each business can source and manage their own Testimonials and can decide which Testimonials to publish on their Profile. 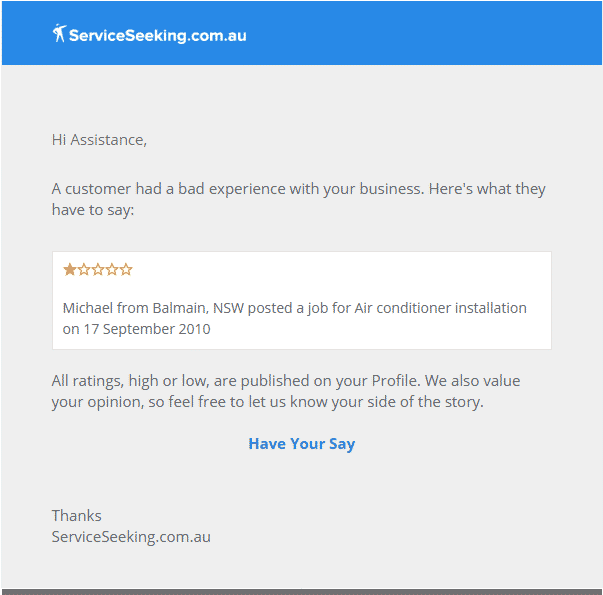 Because Testimonials are not from ServiceSeeking.com.au customers, they do not contribute to a business’ star rating and are shown in the About Us section of a business’ Profile, rather than with Reviews. 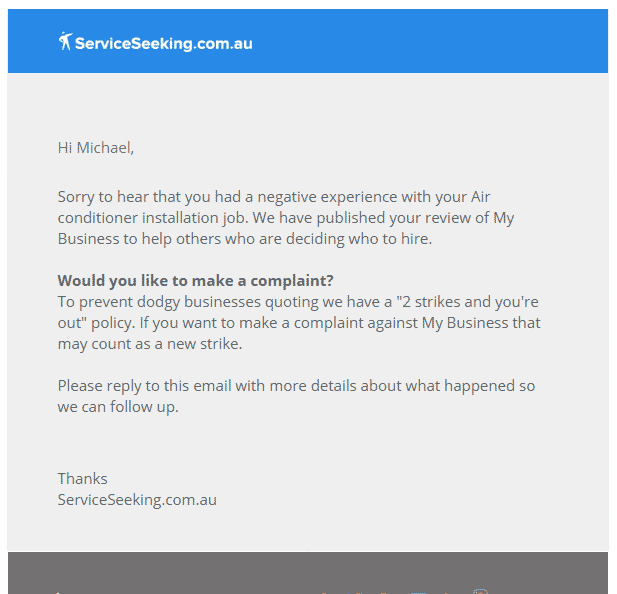 Once a negative review is approved, ServiceSeeking will send you an automated email to ‘Have Your Say’. You can reply to this email with your side of the story and if appropriate, provide us with any proof/documentation that the comment is false. Our team will then review the customer’s comment and decide whether it should be removed from your business profile. What Happens If A Customer Wants to Complain? Once a customer posts negative feedback, ServiceSeeking will automatically send then an email confirming that their review is approved. If they need further help or would like to lodge a complaint against your business, they can reply to this email for our team to follow up. Our authority as a website is limited, and we can’t force businesses to complete the job or process refunds. We can choose who we allow on the site (by banning users), but can can’t take any legal action on behalf of businesses or customers.